Unibet are one of the most popular bookmakers around and are proud sponsors of many key races in the racing calendar including the Unibet Irish Gold Cup at the Dublin Racing Festival and the Unibet Champion Hurdle at the Cheltenham Festival. This weekend they sponsor the Champion Hurdle Trial at Haydock so what better time to take up this superb offer? For example: open an account with Unibet for Saturday, stake up to £40 on the favourite Silver Streak to win the Champion Hurdle trial and if he loses you get your stake back as a free bet! Unibet's comprehensive betting options across UK and Irish racing, along with markets for events across the globe and with their Best Price Guarantee letting you take the early price without risk of losing out on a bigger SP, you can bet with confidence. Unibet also have some great incentives for new and existing customers, such as their Multi-Boost which boosts multiple winnings by up to 30%, In-Play Free Bets which offer a free bet if you place five or more in-play bets in a week, along with Penalty Payback, which offers money back on selected football bets, if a penalty is awarded in Premier League and Champions League matches. This along with a free entry into a 1000 Euro Free Roll Poker event for all sports bettors and an excellent Refer A Friend promotion, that rewards you £60 cash when referring a new customer, makes Unibet a great choice for those looking for great betting options all under one roof. So whether its horse racing, football, casino games or slots that take your fancy, Unibet has it all! 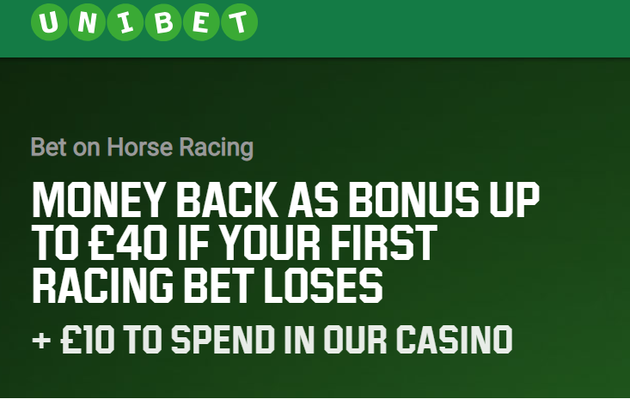 If Your Horse Wins, Receive Your winnings and Stake Back. If Your Horse Loses, Receive Your Stake Back As A Free Bet. £10 Casino Cash Bonus Will Be Credited The Next Working Day After Initial Deposit Is Made.